KIEV, Ukraine -- Ukraine’s government must pay 11 billion hryvnia ($1.4 billion) by the end of next month to service domestic debt, as the country waits for international loan donors to resume payments needed to fund its budget. Premier Azarov says that current debt "is a bomb under our financial stability..."
The government has to repay 6 billion hryvnia this month and 5 billion hryvnia next month, Prime Minister Mykola Azarov said at a meeting with the confederation of industrial companies in the capital Kiev today. The government also needs to cover about 4 billion hryvnia in pension costs, Azarov said, without elaborating. “This is a bomb under our financial stability,” he said. Borrowing costs rose to 15 percent at an auction of 3.3 million hryvnia last week, compared with 11.42 percent at the end of March, as investors wait for the International Monetary Fund to resume its $16.4 billion program to help Ukraine cover its financing needs. Credit default swaps on five-year debt rose 20 basis points yesterday to 523, the biggest jump since Feb. 4. The former Soviet state has received $10.6 billion from the Washington-based lender to date. Deputy Premier Serhiy Tigipko said in an April 15 interview his government struck a deal to extend its IMF program. The government is also trying to reduce its budget deficit by negotiating a lower price for gas imports from Russia. Azarov said today those talks were “extremely difficult,” as he urged manufacturers to reduce their energy consumption. 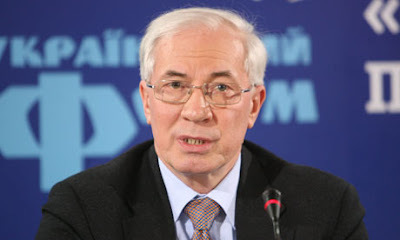 “Everything depends on Russia’s good will,” Azarov said. Manufacturers need to consume less energy because Ukraine “cannot buy such expensive gas,” he said. Russian President Dmitry Medvedev and his Ukrainian counterpart Viktor Yanukovych will tomorrow try to finish talks to determine how much Ukraine must pay Moscow for gas imports. The meeting will be their third in two months. “I hope that we will review the contract and come to a mutually beneficial agreement with Russia,” Azarov said. The country’s Fuel and Energy Minister Yuriy Boyko was in Moscow yesterday to discuss gas contracts, Russian state- controlled gas supplier OAO Gazprom said in a statement, without providing any details.